Now that the weather is getting a little warmer, I've been craving a lighter fresher menu. Fresh produce, crisp salads, fresh herbs. It all seems to be hitting the spot, lately. Don't get me wrong..I still LOVE a hearty stick to your ribs kind of dinner, but that often makes me think of cold weather and needing to warm up and fill your belly. Know what I mean? This wasn't really a recipe, but it was too good not to share. It was absurdly simple to make and was ready in a snap. It's the perfect mid-week dinner when you've just gotten home from a long day and you don't feel like going to a lot of trouble for dinner. Serve with some steamed veggies and maybe some rice, boom there's dinner! 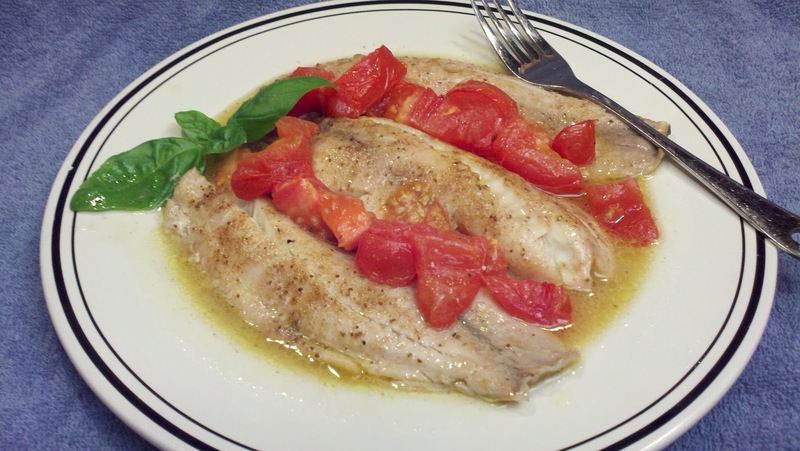 Place tilapia fillets in a casserole dish. Drizzle with a little olive oil. Season generously with garlic powder, Old bay, salt and pepper. Cut the tomato into large chunks. Place on top of fillets. Pour white wine over all. Dot with butter. Bake about 25-30 minutes or until the fillets are cooked and are easily flaked with a fork. That's it!! Try adding a little chopped fresh basil or parsley over the top as you take it out of the oven. It adds a little extra layer of flavor! Place seasoned fillets on large pieces of heavy duty foil (or several layers of regular foil). Top with tomatoes, butter and a splash of wine. (You can also add sliced onions or scallions if you like). Fold the foil over and seal the edges to make a closed packet. Pierce the top to vent steam. Place on a grill and cook until the fish is tender and flaky. Easy!